Shoberl, Fr.(ed.) : The World in Miniature. 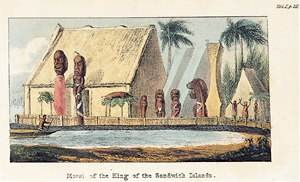 South Sea Islands. Being a description of the manners, customs, character, religion and state of society among the various tribes scattered over The Great Ocean, called the Pacific, or the South Sea. London, printed for R. Ackermann, n.d. 9 × 14 cm., rebound in leather, contemporary calf backed, extremities worn, covers of vol.1 restored, ex-libris.